In the wake of the North American Free Trade Agreement and the terrorist attacks of September 11, 2001, renowned public intellectual and scholar Stephen Clarkson asks whether North America "exists" in the sense that the European Union has made Europe exist. Clarkson's rigorous study of the many political and economic relationships that link Canada, the United States, and Mexico answers this unusual question by looking at the institutions created by NAFTA, a broad selection of economic sectors, and the security policies put in place by the three neighbouring countries following 9/11. This detailed, meticulously researched, and up-to-date treatment of North America's transborder governance allows the reader to see to what extent the United States' dominance in the continent has been enhanced or mitigated by trilateral connections with its two continental partners. 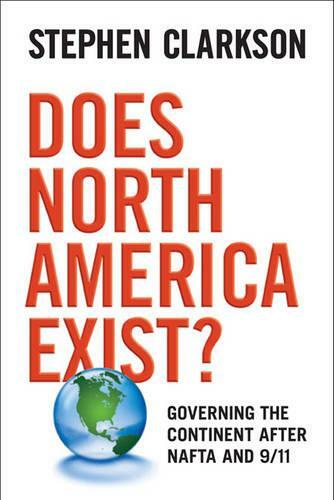 An illuminating product of seven years' political-economy, international-relations, and policy research, Does North America Exist? is an ambitious and path-breaking study that will be essential reading for those wanting to understand whether the continent containing the world's most powerful nation is holding its own as a global region.